129 min. Allied Artists/Columbia Pictures. Directors: John Huston, Michael D. Moore. Cast: Michael Caine, Christopher Plummer, Sean Connery, Saeed Jaffrey, Shakira Caine. No less than the creator of Peter Pan, J.M. Barrie, called Rudyard Kipling's "The Man Who Would Be King "the most audacious thing in fiction." But the tall tale had a basis in the real-life brass of adventurers like Josiah Harlan—an American who fancied himself the next Alexander the Great and became the Prince of Ghor in what is now Afghanistan—and James Brooke, who went from being an ensign in the Bengal Army of the British East India Company to being the first White Rajah of Sarawak in Borneo. For John Huston, Kipling's story was a passion project that languished for twenty years and, at various times, could have starred Clark Gable and Humphrey Bogart, Kirk Douglas and Burt Lancaster, or Paul Newman and Robert Redford. It's all for the best that Huston had to wait until 1975 and make the film with Sean Connery and Michael Caine, a terrific pairing. Kipling's exhilarating and disconcerting tale of high adventure concerns Peachy Carnehan (Caine) and Danny Dravot (Connery), the good-humored scourges of 19th century British India. By chance, Rudyard Kipling (Christopher Plummer)—then a correspondent for The Northern Star newspaper—meets the blithely criminal rogues, who confide in him that they're abandon their small-time scams and going all in on a plan to become kings of Kafiristan, in the Hindu Kush once explored by Alexander the Great. Though the scheme will require a treacherous journey over the Khyber Pass (not to mention battles with local villagers), the untold rewards could mean security for life. In the film's framing device, Peachy returns to Kipling to retell his exploits with Danny; since Peachy is a sorry sight indeed, one is primed for disaster. Though there are echoes here of the 1939 film Gunga Din (also adapted from Kipling), The Man Who Would Be King perhaps best recalls The Treasure of the Sierra Madre and The Maltese Falcon, Huston's earlier classics about enterprising men who seek treasure and discover the darkness of their hearts. Peachy and Danny succeed by the skin of their teeth and with a great deal of luck, including the discovery of leftover Gurkha soldier Billy Fish (a nicely energetic Saeed Jaffrey); without his ability to translate, the men who would be king might have gotten nowhere, but instead all goes according to plan, at least at first. Peachy and Danny insinuate themselves with the locals, train and arm an army, and usurp a kingship, partly by perpetuating the belief that at least one of them is a god. It also doesn't hurt matters that "Sikander" (Alexander the Great) has been through these parts, clearing the way for conquerors to follow. That Huston and co-scripter Gladys Hill pitch the film between the familiar poles of straight imperialist critique and blithe imperialist endorsement is both true to Kipling and a reason the film stands apart from the pack. Anyone with two eyes can see that Peachy and Danny are anti-heroes at best. To achieve their own glory and fortune, they nakedly exploit the native villagers, and one of them becomes so enraptured by his own power that he begins to believe his own press: that he is a god (and the character's dubious redemption comes only when it's positively forced upon him). On the other hand, Huston also celebrated the creativity and ballsiness of men who dream big and dance as fast as they can (yes, it's a man's world: the only female character, who remains silent, is played by Caine's wife Shakira). Caine and Connery play off of each other like old pros, and both are equally capable of going into their characters' dark corners. As far as Peachy and Danny are concerned, they're giving the people what they want (more "heathen idols"), but, as always, there'll be hell to pay for hubris. 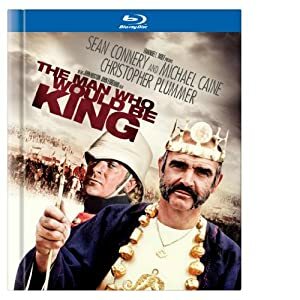 Warner gives The Man Who Would Be King the royal treatment in a new Digibook Blu-ray edition. Image quality noticeably improves over any previous edition, with truer color and more evident detail. The film's age remains apparent, and softness does intrude on the image from time to time, but most of the image's minor deficiencies are simply products of the source: the faithful and film-like picture almost always pleases the eye. The lossless DTS-HD Master Audio 1.0 track is certainly nothing if not faithful; dynamics are obviously limited here, but cleanliness and clarity are good. 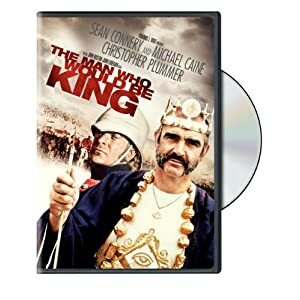 The disc's primary bonus feature is the vintage promo "Call It Magic: The Making of The Man Who Would Be King" (12:00, SD), offering terrific set footage, film clips, and interview snippets from director John Huston, Sean Connery, Michael Caine and producer John Foreman. Also included is the film's "Theatrical Trailer" (1:06, SD). The thirty-two-page, full-color Digibook includes essays, cast bios, Oscar stats, and plenty of photographs. All site content © 2000-2019 Peter Canavese. Page generated at 04/18/2019 12:30:49AM.